Wake Forest University is a highly selective private research university offering a well rounded, challenging liberal arts education known for a hands-on approach to learning. Located on a beautiful campus in Winston-Salem, North Carolina, Wake Forest is home to just under 5,000 undergraduates. The downtown is only 3 miles from school, with tons of galleries, shops, restaurants and performance spaces. Winston-Salem is in the Piedmont Triad of N.C., with Raleigh 2 hours away and Charlotte a 90-minute drive. Greek organizations play a significant role at Wake Forest, with a membership consisting of almost half of the student body. Visitor Information: Campus Visits are hosted by the Office of Undergraduate Admissions in the Porter Byrum Welcome Center. Your visit will always include a one-hour information session led by a member of a WF staff. Campus tours are offered most days Monday through Friday when classes are in session and are led by current Wake Forest students. They also host a handful of Saturday information sessions and tours in the fall and spring. Transportation: The Piedmont Triad International Airport (GSO) in Greensboro, often called PTI for short, is the closest airport to campus — about a 30-minute drive. Charlotte Douglas International Airport (CLT) is about a 90-minute drive to Wake, and Raleigh-Durham Airport (RDU) is about a 2-hour drive to school. ABC Door 2 Door Transportation in Winston-Salem provides transportation to and from PTI. Traveling by train? Amtrak provides rail service to Winston-Salem and the Piedmont Triad through its Carolinian route. The closest station to the university is High Point, at 100 W. High Street, approximately 30 minutes from campus. Greyhound One of the largest bus companies in the U.S., travels to the area. The Greyhound station is located in downtown Winston-Salem on Trade Street. Stay: You’ll feel like you’re at a grand estate rather than a hotel arriving at the Graylyn, on the Wake campus. This historic home, now owned and operated by the University, sits on 55 acres, yet is just a few minutes from downtown Winston-Salem. Prefer to stay right in town? A new favorite amongst visiting families is the boutique Kimpton Cardinal Hotel, four miles from Wake, housed in the historic former R. J. Reynolds Tobacco Co. headquarters. Two other good options are the Brookstown Inn or the Marriott on Cherry. Coffee: On campus, stop by the ZSR Library for a Starbucks before your tour, it opens bright and early during the week starting at 7 am. Student-run Campus Grounds, in the Taylor-Residence Hall, is another great spot to get a caffeine jot alongside the crowd heading to class. In town, pastries are made fresh every morning at Camino Bakery to go with the local Krankies’ Railhead espresso. Or go right to the source—Krankies has a downtown location and a popular airstream located on Reynolda Road. Breakfast: Popular items include biscuits and gravy, egg scrambles, build your own Benedicts, or the cinnamon swirl French toast at Mary’s Gourmet Diner, a local institution. Midtown Café and Dessertery is another good choice to start the day. Lunch: Mingle with students at the food court at the Benson Center, recently redone and the heart of Wake’s campus. Shorty’s is a full service restaurant in the food court, with both indoor and outdoor seating. Classic American fare is the attraction at Village Tavern in Reynolda Village, a favorite local hangout for visiting families. The Tavern is known for its excellent Sunday brunch, perfect if you’re visiting over a weekend. A current senior told us she will miss the sandwiches at Diolis Italian Market when she graduates, her absolute favorite lunch spot for a quick bite. Build your own sweet potato at Sweet Potatoes also known for its fried chicken and waffles, excellent sandwiches, and burgers. Willows is another good downtown option. Casual: Mozelle’s is the go-to spot when in Winston-Salem for fried chicken, shrimp and grits, or tomato pie—it’s southern cooking at it’s best. (Also good at lunch or for weekend brunch.) Sixth and Vine is a wine bar with an eclectic menu, funky décor and a lovely patio to enjoy tapas and flatbreads. For innovative Tex-Mex, head to The Porch - their Fajita dinner is a homerun. In the mood for Italian, Di Lisio’s is your spot. We hear great things about Cuban/Caribbean Miami with one student stating, "Go for lunch or dinner and order the Cuban Bowl or Mofongo." A Step Up: Katherine’s may be one of the new spots in town, but it’s already a local favorite for updated Southern cuisine with a French twist. Spring House has a killer menu and a setting to match, housed in a historic residence. Bernardin's started by two brothers serves French American fare, it’s a fine dining experience good for celebrations. Students like to take their parents to Ryan's when they’re visiting, serving steak and seafood not conducive to a student budget. Local Attractions: The Reynolda House Museum of American Art showcases an impressive collection of American Art in the restored mansion of R.J. and Katharine Reynolds. The adjacent Reynolda Gardens are open to the public year round with spectacular formal gardens and a trail to explore. Glimpse the early history of Winston-Salem with a visit to the Old Salem Historic District, while there be sure to sample traditional Moravian pastries from the Winkler Bakery. Located about three miles from the main campus, downtown Winston-Salem is a lively area with fun galleries and shops; performance spaces, restaurants, and museums--fun for an afternoon wander. Art lovers should head to the Southeastern Center for Contemporary Art, known as SECCA (admission is free.) A current listing of events in the area can be found at VisitWinstonSalem.com. Additional Colleges Nearby: Winston-Salem is home to more schools than just Wake Forest. Winston-Salem State University is the first Historically Black University in the country to grant degrees in elementary education. Its Diggs Gallery is recognized as one of the Top 10 African-American galleries in the U.S. for contemporary African art. Tiny Salem College and Academy with only about 1,000 students was founded in 1772, it's the 13th-oldest college in the country, and the oldest women’s college as well. North Carolina School of the Arts is a public arts conservatory and trains students to be professional artists. Cambridge, Massachusetts seemed to have all I wanted: history, universities, a mixture of races, great bookstores, churches and places to party on Saturday night. Just toured the Wake Forest Campus? 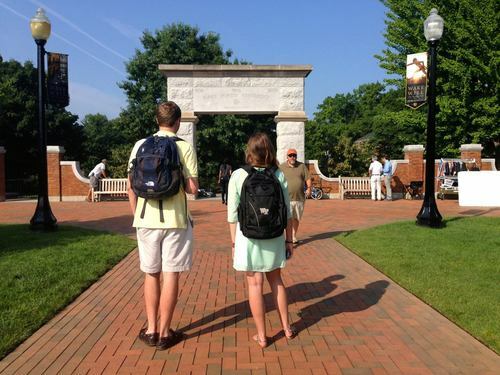 Are you a Wake Forest student, parent or Alumni? Fill out this 2 minute survey to supplement our Daytripper University Guide for Wake Forest University!